Seeking an answer to the question, in Global Cities Index, which examines a city’s current performance based on business activity, human capital, information exchange, cultural experience, and political engagement, Mumbai ranks 44th of the 125 cities selected across the world, followed by New Delhi 61st, Bangalore 75th, Chennai 77th, Hyderabad 78th, Kolkata 84th, and Ahmedabad worst, 101st. 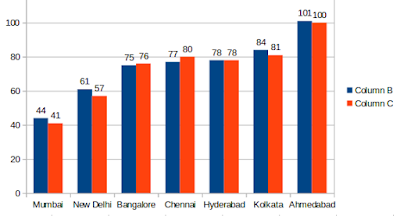 In its second criterion, Global Cities Outlook, which seeks to project a city’s potential based on rate of change in personal well-being, economics, innovation and governance, Bangalore ranks the best of Indian cities, 73rd out of the 125 cities chosen, followed by New Delhi 76th, Hederabad 91st, Mumbai 93rd, Ahmedabad 94th, Chennai 98th, and Kolkata 110th. 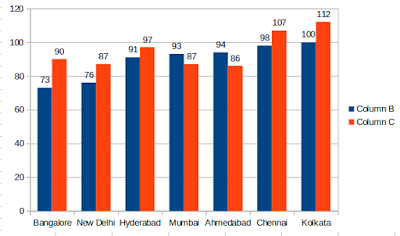 In Index, the cities which make it to the top 10 are London, New York, Paris, Tokyo, Hong Kong, Los Angeles, Chicago , Singapore, Beijing and Washington DC. In Outlook, other cities which are in the top 10 are San Franciso, New York, Boston, London, Houston, Atlanta, Stockholm, Amsterdam, Munich, and Zurich. “Cities with an engaged network of information-sharing, specialized talent, a vibrant economy, and policies that enable technology adoption and experimentation help to define today’s smart cities and can help others as they seek to adopt smarter policies for the future”, it underlines.